It's the season of love now! We're here now in the month of love and happiness. In February, our friends all over Asia are celebrating the biggest festival of the year, the Asian Lunar New Year. At the same time, we have St. Valentine's Day, a special occasion to send our valentines for our love ones. Two special occations in one month of joy, happiness and prosperity. 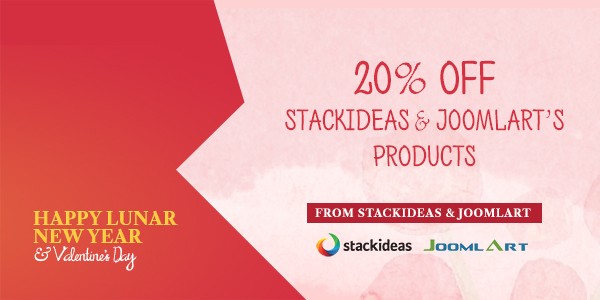 This loving season, JoomlArt together with Stack Ideas would like to send YOU the special Valentines deal of 20% OFF on all new subscriptions from Feb 14th, 2015 to Feb 24th, 2015 with the coupon code: JOOMSTACK20. Or use the coupon code JOOMSTACK20 during checkout! Head to Stack Ideas, to find out more about our partner's products and grab our Valentines' deal now! Valentines day is a day to celebrate love and express it in the most meaningful way possible. Stay in love, and celebrate it with all your heart. Happy Valentine's Day! And also, have a prosperous and happy Lunar New Year! Please note that we will offer a limited support between February 14 and February 23. We will be back in the office on Tuesday, February 24, 2015.